Joseph Wilson, quoted in Timothy Noah (2003-09-16). "Did Rove Blow a Spook's Cover?". Slate. Suskind, Ron (2004-10-17). Faith, Certainty and the Presidency of George W. Bush. The New York Times Magazine. Danner, Mark (2007). "Words in a Time of War: On Rhetoric, Truth and Power". in András Szántó. What Orwell Didn't Know: Propaganda and the New Face of American Politics (First edition ed.). Philadelphia, PA: PublicAffairs Reports. pp. 17. "... the unnamed official speaking to Suskind is widely known to be none other than the self-same architect of the aircraft-carrier moment, Karl Rove ..."
I don’t oppose all wars. What I am opposed to is a dumb war. What I am opposed to is a rash war. What I am opposed to is the cynical attempt by Richard Perle and Paul Wolfowitz and other armchair, weekend warriors in this administration to shove their own ideological agendas down our throats, irrespective of the costs in lives lost and in hardships borne. 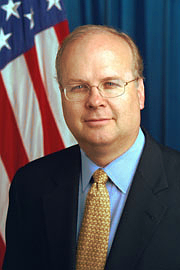 What I am opposed to is the attempt by political hacks like Karl Rove to distract us from a rise in the uninsured, a rise in the poverty rate, a drop in the median income, to distract us from corporate scandals and a stock market that has just gone through the worst month since the Great Depression. That’s what I’m opposed to. A dumb war. A rash war. A war based not on reason but on passion, not on principle but on politics. Remarks of Illinois State Sen. Barack Obama Against Going to War with Iraq (2 October 2002); referencing the positions of former Pentagon policy adviser Richard Perle, Deputy Defense Secretary Paul Wolfowitz, and chief Bush political adviser Karl Rove. Is this just math that you do as a Republican to make yourself feel better. or is this real? This page was last edited on 17 October 2018, at 14:36.